Had a bit of a problem with ancillary belt drive the other day (2010-10-01). I started the car to go home and there was a bit of a rattling, clunky noise coming from the engine sounding like something was loose. On closer inspection, the ancillary belt was flapping around quite a lot. I stopped the engine and had a closer look and there was an awful lot of slack in the belt. Just as well I decided to have a look as it wasn't driving the pulleys properly and I was about to go on the motorway. This belt drives the alternator, power steering pump and water pump (which in turn is connected to the radiator fan via a viscous coupling). So I would have either ran the battery flat, over heated the engine or most likely both. At first it looked like I had completely lost a tensioner or idler wheel. There appeared to be a blank boss which looked like it was where a belt should be. But after some research (see image of belt run below) it was apparent that this was just the centre pivot of an 'L' bracket (1 in diagram), which is used to pivot the tensioner pulley into the belt lower down. Feeling lower down to where the pulley should be, I immediately found the bolt that holds the pulley to the bracket was hanging out! I could just grab it with my finger and pull it out. The threads on the end of the bolt were full of aluminium and so it had obviously stripped the hole it was screwed into. This hole is in the 'L' bracket. Initial reaction was that I was going to have to replace the bracket, which I REALLY did not want to do as it would obviously be a BMW only part being a small casting. This would of course equal 3 figure amounts of GBP. So to determine what was going to be required I stripped out the bracket to inspect it closer. This was easily done, with the exception of requiring a 17mm hex key, which is pretty big and not normally in most tool kits. Luckily, where I work, I was able to find one. This was required to slacken the large boss in the centre of the 'L' bracket. Remove radiator cowling - 2 plastic pop rivets at top. Remove front section of engine top cover - three cap head bolts. *Remove tensioner pulley bolt (already out on mine). With tensioner pulley bolt out the pulley itself will be free to come out. At this stage make a good note of the belt run. I managed to keep the belt in place. See image. Remove bolts at either end of tensioner spring and remove spring (both ends required as bracket + spring wouldn't come out past pipe work). Remove large central pivot bush with 17mm hex key (once slackened, easy to remove by hand). 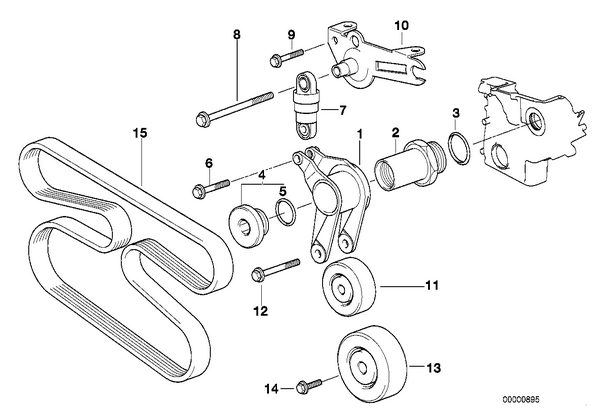 *Removing the tensioner pulley bolt if in tact would require the tension being removed form the belt first. In order to do this, I used a long bar (crow bar) to lever the 'L' bracket upwards to remove tension from the belt. Note that I did not have to do this at first as the pulley bolt was out and the wheel displaced so there was no tension. This is required if one wants to remove the belt (or 'L' bracket in this case) as the belt passes through a fork in the bracket. Once the bits were out it was indeed obvious that the problem was that the bolt had stripped the thread out of the bracket. Its hardly surprising as there is only about 1.5D of thread depth which is not a lot at all for aluminium. Even though it is not under any axial loading, like I said it needs to be removed every time the ancillary belt is replaced, so it is easy to imagine when the belt has been replaced in the past that someone has probably just done the bolt up too tight. The pulley itself and everything else all seemed to be perfectly in tact. One thing that was worth noting was that the 'L' bracket, when in situ, had managed to pivot itself past its top dead centre with the spring so that it was fully pivoting the wrong way. this must have been as a result of snatching the loose belt and this is why there was so much play in the belt. So now all that I had to do was repair the stripped hole in the 'L' bracket, which was a straight forward Heli-Coil operation. This was the first time I had used a Heli-Coil myself and I was very impressed at how easy it was and how simple yet effective it is. It saved throwing the 'L' bracket away just because of one damaged hole. The upshot of this simple fix was also NO COST, as if I had taken it to a garage I would have been charged several hours of labour time and no doubt their solution would have been to tell me that the 'fa-lan-gee' was broken and just gone to BMW and ordered a new 'L' bracket, which I dread to think how much it would cost as its definitely a BMW only part, which = license to print money! Either that or they would tell me that's what was needed, charge me accordingly, then just Heli-Coil it anyway. Either way I reckon I saved a minimum 300 GBP. Refit was, as very often, reversal of removal... and the engine started and has been running fine since.